Bast, the catlike goddess, released the sun from the stables as she did every morning, wrapped her sunrise cloak around herself, and went for a walk through the world of man. Usually she was content to observe their struggles and victories as she walked unnoticed along the lush banks of the Nile, but today, she felt mischievous. She enjoyed testing the sons and daughters of man. If they performed well, she’d reward them. If not, they’d find her wrath unforgettable. She came upon a small but beautiful valley hidden between two gentle peaks. Two rough cottages, one small and one large, huddled together at the intersection of a small stream and a dirt road. The goddess saw a woman come out of one of the cottages, peer in her direction for a moment, and turn to stirring a large copper pot bubbling outside the door. As she approached, she saw the woman stirring wool in the hot dye. The goddess changed her appearance. She appeared to be a crone bent with age and carrying a bundle of twigs on her back. Her splendid cloak transformed into a tattered rag dragging in the dirt, and she limped and wheezed as she walked. The woman at the cottage stood with her hands on her wide hips and a look of concern on her weather-beaten face as she watched Bast’s slow and arduous progress. “A crust of bread for some kindling?” begged the crone, ignoring the stack of firewood behind the younger woman. “Nonsense,” said the bustling woman as she poured the milk. “You must be half frozen from the morning chill. 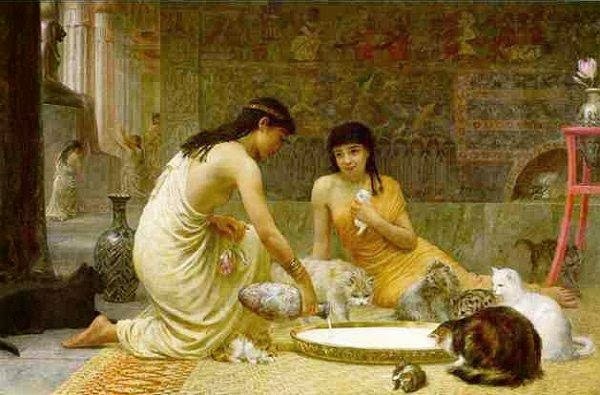 My husband left for the city this morning, and I’ll never be able to eat all this alone.” Bast knew her hostess was stretching the truth. From the size of her portion, Bast knew Mauv’s generosity would result in some skimpy meals ahead. “Your husband is away?” Bast asked, wanting to know more about her benefactor and savoring the taste of the simple bread and cheese. Before the disguised goddess could reply, Mauv was off the stool and wrapping a heavy shawl around the old woman’s shoulders. “My gran was always cold,” she explained, “even when she was sitting by the fire.” In a moment, the weaver was back at her loom, passing the shuttle from side to side. Even from where she was sitting, Bast could see Mauv was creating a beautiful piece of dark green fabric from yarn dyed in the pot outside. “No,” said Mauv, “but the merchant who buys the wool and his shearers pay a good price.” She clipped bits of yarn and dropped them into a bag overflowing with other pieces of yarn and wool. “Who’s the bag for?” Bast asked, knowing every piece of wool was precious to a weaver. “They live across the road?” The goddess stroked the softness of the boy’s work, feeling the care and skill woven there. The old woman looked at the beautiful weaving in the borrowed shawl. “This is a fine piece of work,” she said. The old woman nodded, treating the wish seriously. When the shepherd’s wife returned from attending the wool, the crone was gone. Mauv peered up and down the road but saw no sign of the beggar woman. She wondered how the visitor had gotten out of the cottage without her noticing, but just then the dye pot boiled over and she had other things to worry about. Many miles away, Mauv’s weary husband stopped to wipe the sweat from his brow. The sheep took advantage of his pausing on the roadway to graze on nearby clumps of grass. He smiled. “I’ll try it. I have a large flock, enough to make their trip worthwhile. I will return home immediately and send a message to the merchant with the offer of an extra bag if he comes to us instead of us going to him.” He turned to thank the woman, but she and her water jug were already gone. Later that day, the wool merchant received a message from a passing trader about the shepherd, and he and one of his shearing crew left the city. The shearer was headed toward the shepherd’s pass, and the merchant was bound to oversee the loading of a ship on the nearby Nile. The merchant’s man didn’t reply. He was staring at a lone figure coming slowly down the road toward them. The merchant turned to see an old woman stumbling along under a heavy weight. Without a glance, she staggered between them, a hefty burden at the end of a stout pole over her shoulder. “Madame!” exclaimed the merchant, amazed at the sight at the end of her pole. She turned, carefully keeping the large fish from touching the ground. “Sir?” she asked, as if carrying a giant fish was a common occurrence. “And this is the largest of the ones he caught?” asked the shearer, not taking his eyes off the sparkling scales. “The very same, sir. Now I must get this to market before it cooks in the midday sun.” Bast turned to struggle on through the city gates, a smile on her lips. In the meantime, things were happening over the pass, and Bast took the shape of a bird to quickly return to the field near Mauv’s cottage. The shepherd had gotten his sheep home but had them on the road again. “Where are our young man and his travelling sheep headed now?” Bast asked. She was again the woman with the water jar. “Yes. You might even find time for other things,” she said with a twinkle in her eye. Back in the city, Bast, overloaded with a bolt of woven wool, knocked on the door of a large merchant’s house. The servant fetched the mistress of the house who was having lunch with several other wives. The goddess had one more stop before her daily walk was finished. As she walked down the dusty road near the submerged field, she was pleased to see hungry fish leaping into the air. The goddess looked over a rock wall at a stout woman digging aggressively at some weeds. “What a beautiful garden!” Bast exclaimed. “That man is never home in the afternoon! What could he be doing? And did you say a lake? We don’t have a…” Her words drifted into the empty air on the other side of the stone fence. The goddess hurried to be home by sunset. The last time she’d left the sun out all night, both the gods and the mortals had been very upset, but that’s another story. And it has nothing to do with a famous little village known to this very day for its hospitality, high quality woven goods, excellent fishing, and the finest shepherds and shepherdesses in the land. Tom Howard is a science fiction and fantasy short story writer who lives in Little Rock, Arkansas. He thanks his four children for his inspiration and the Central Arkansas Speculative Fiction Writers' Group for their support. Where do you get the ideas for your stories? Various places. My children give me lots of story ideas. This story idea came from the traditional "gods walking among men" trope which I've always wanted to play with. What do you think is the most important aspect of a fantasy story? To create a believable world, even if it is made up. What do you think is the attraction of the fantasy genre? Infinite possibilities.